One of my favorite wineries from a trip to Paso Robles earlier this year has opened a new tasting room in Downtown Paso. While I definitely think you should spend some time in the Downtown Paso area, make sure you get to the winery at some point as well. You won’t be disappointed by a wine lunch on the JUSTIN patio overlooking the vineyards. Here’s more information on the new tasting room. Today, JUSTIN Vineyards & Winery opens a second Tasting Room location situated prominently on the square along Downtown City Park in Paso Robles. As the region continues to gain global recognition as an award-winning AVA, this expansion allows more visitors the firsthand opportunity to experience the renowned JUSTIN brand. As guests enter the JUSTIN Downtown Tasting Room, they are met with an elegant space featuring an expansive wine-tasting bar, lounge, and a full dining room, all ideal for exploring JUSTIN’s portfolio of award-winning Bordeaux-style wines. Guests can enjoy JUSTIN’s seasonal wine-tasting flight and select wines by the glass, which can be savored alongside a locally-sourced artisanal cheese platter or pâté board. Those looking for a more formal dining experience are encouraged to indulge in the rotating menu of à la carte items or a seasonal pairing flight, both inspired by the award-winning Restaurant at JUSTIN. Every detail of the new space was artfully curated and customized—from the “infinity” underground bottle display at the front alcove down to the pattern of the floor tile, which is a reproduction of the famous “Gaudí tile” designed by Catalan architect Antoni Gaudí in the early 20th century. Kaoru Mansour, a Japanese-born artist now based in Los Angeles, created the series of six paintings displayed throughout the dining area and French artist Christophe Côme created the room’s dramatic metal and glass divider. Throughout the space, 14 state-of-the-art high-definition screens take guests on a visual enological journey coined, “Liquid Containers.” The rotating digital installations produced by Mill+, a collective of the Oscar-winning studio The Mill, feature a series of different JUSTIN wines being slow-poured at 1,000 frames per second. The new JUSTIN Downtown Tasting Room is located at 811 12th Street (next to the historic Acorn Building) and is open to the public Sunday through Thursday from 11 a.m. to 6 p.m., Friday and Saturday from 11 a.m. to 8 p.m., as well as for private events by reservation only. Located in Paso Robles, JUSTIN® Vineyards & Winery was founded in 1981 and is known for crafting world- class wines using Bordeaux grape varieties. 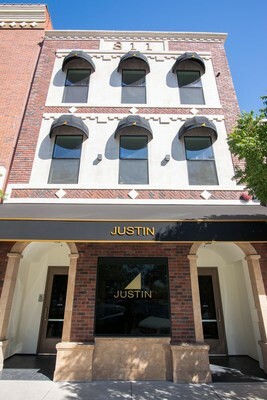 Widely recognized for their iconic ISOSCELES® Bordeaux-style blend, JUSTIN is also known for their Cabernet Sauvignon. The estate, located at 11680 Chimney Rock Road features a Tasting Room, luxury five-star accommodations at the JUST Inn®, and a Restaurant—making it one of the only wineries on the Central Coast to offer all three options. In addition to its stellar hospitality, JUSTIN consistently receives top honors around the world, establishing itself as a leader in Bordeaux-style winemaking. JUSTIN wines are available through discerning fine wine retailers and restaurants throughout the United States, or directly from the Winery via JUSTIN’s Tasting Room, online store or to members of the exclusive JUSTIN Wine Society wine club. To discover more about what makes JUSTIN unique, visit www.justinwine.com.